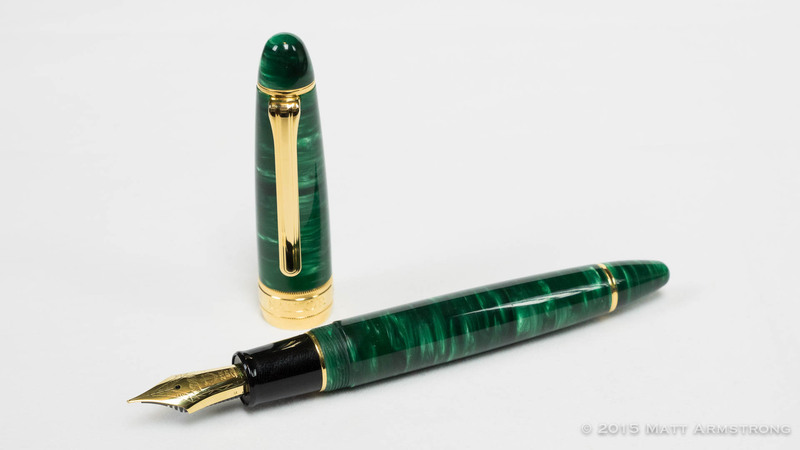 If you collect pens, every once in a while you will come across a special one: the pen that is such a perfect fit for your hand, your writing style, and your aesthetic sensibilities that you wonder if you will ever again feel the need to purchase another pen. 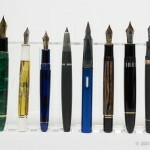 In the last three years of collecting and using fountain pens, I have had an opportunity to buy or use hundreds of pens. 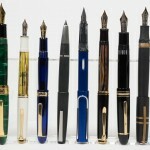 These pens have ranged from disposables costing a dollar or two to those costing upwards of $1,000. Some I have hated, others I have loved. 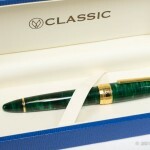 But of all the pens I have ever used, the Classic Pens LB5 is my perfect pen. 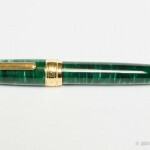 So much so, in fact, that I have not purchased a single pen for myself in the six months since purchasing my last LB5. 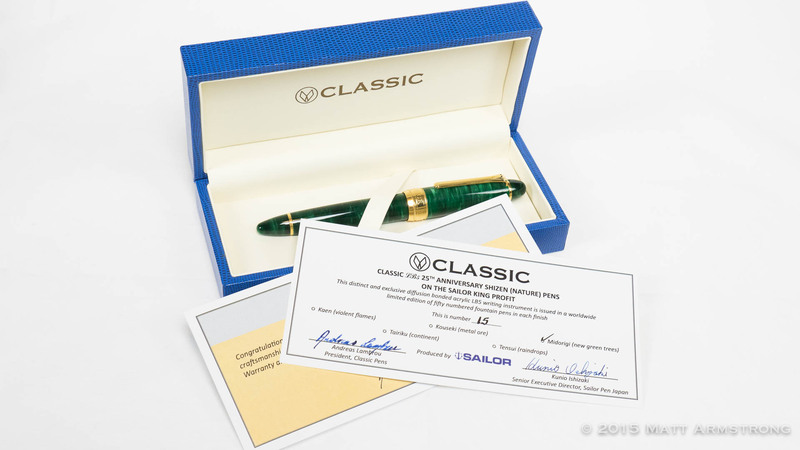 Classic Pens is a U.S.-based company located in El Paso, Texas, and run by renowned fountain pen author and collector, Andreas Lambrou. 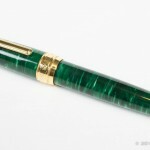 “Andy” has literally written the book on fountain pens (several of them, in fact). 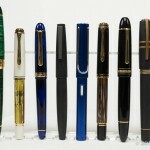 He and his co-authors have written a series of well-respected, exhaustive, and beautifully-photographed books including Fountain Pens of the World, Fountain Pens of the United States and United Kingdom, and Fountain Pens of Japan. 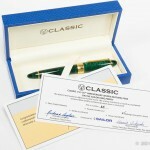 Under his leadership, Classic Pens contracts with major pen manufacturers (like Sailor of Japan) or master craftsmen (like Paul Rossi) to manufacture extremely high-end pens out of beautiful and unique materials. 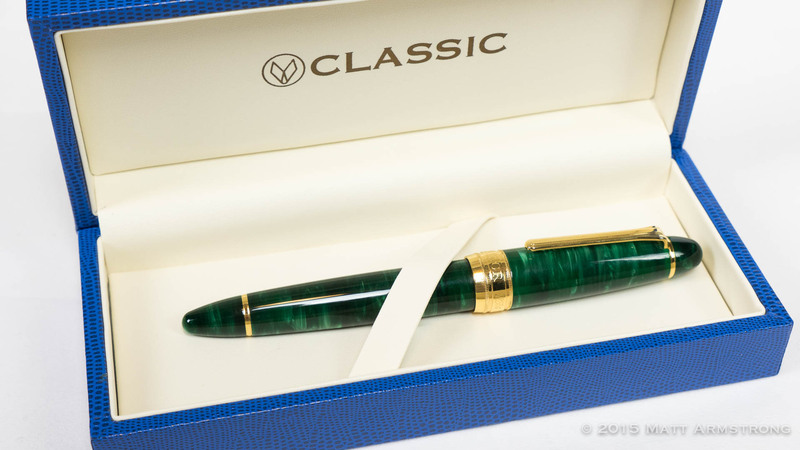 Most of Classic Pens’ models are made in extremely limited quantities and with a level of craftsmanship that simply can not be surpassed. And they have a price tag to prove it. 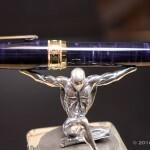 Let’s get this out of the way up front: The Classic Pens LB5 is an extremely expensive pen. 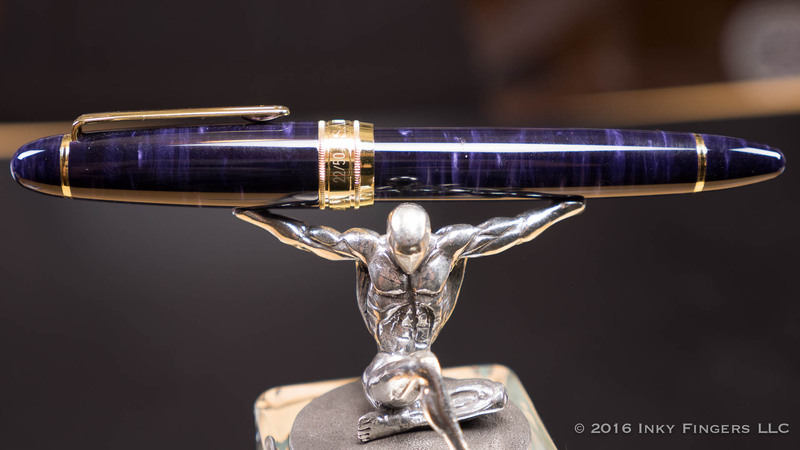 At $1,250+ per pen, the LB5 really can’t be justified as anything other than a high-end status symbol in a luxury writing instrument. 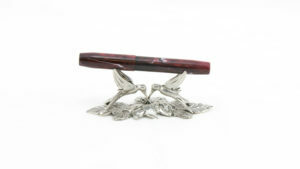 It is a work of art in pen form that is designed to capture peoples attention and make a statement. 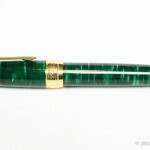 Nobody needs a pen that costs that much money. 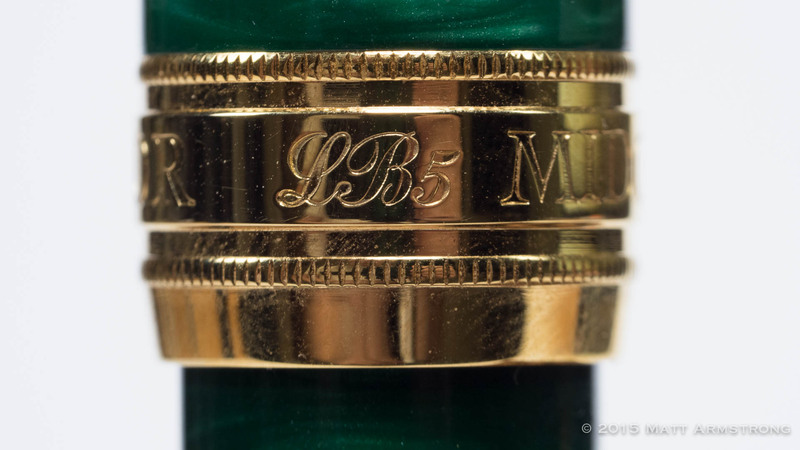 However, with that in mind, I can still honestly say that the LB5 is the best pen I have ever used. It is just that good. 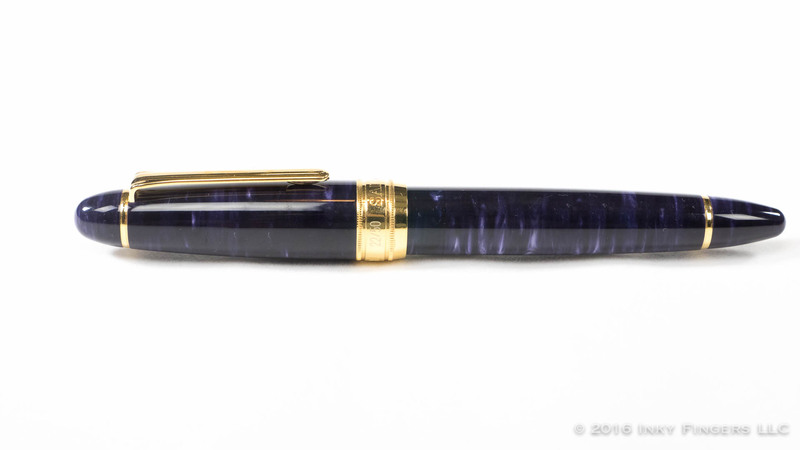 The LB5 is manufactured by Sailor of Japan and is modeled on the company’s flagship King of Pen/King Profit model. 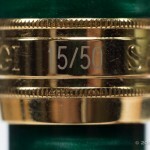 Made 5mm longer than the standard Sailor KOP, the LB5 is manufactured out of a material called diffusion-bonded acrylic. This material is made by casting several different 3mm sheets of colored acrylic, each with its own color and pearlescent swirl pattern. Those sheets are then stacked atop each other and bonded together, then the blanks for the pen are cut against the grain of those layers. 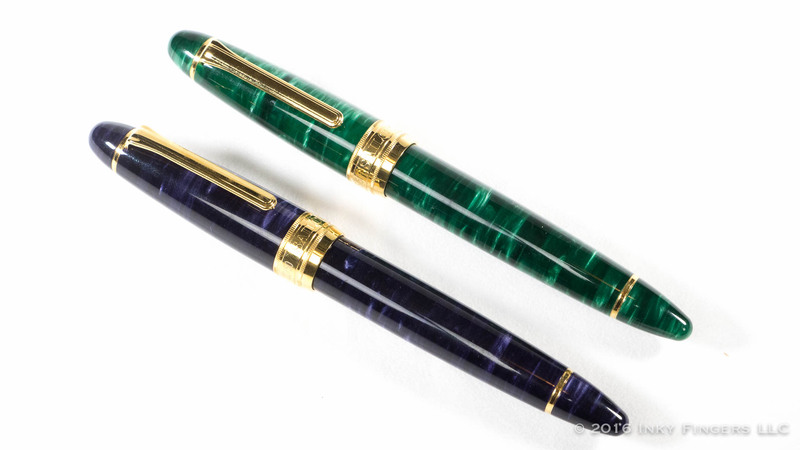 The pen has been manufactured in five colors named after nature: Kaen Red (Violent Flames), Tensui Raindrops (Space Blue), Kouseki Brown (Metal Ore), Midorigi Green (New Green Trees) and Tairiku Continent in either Amethyst Mauve or Continent White. 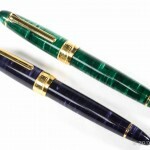 Each model is limited to a numbered run of 50 pens. 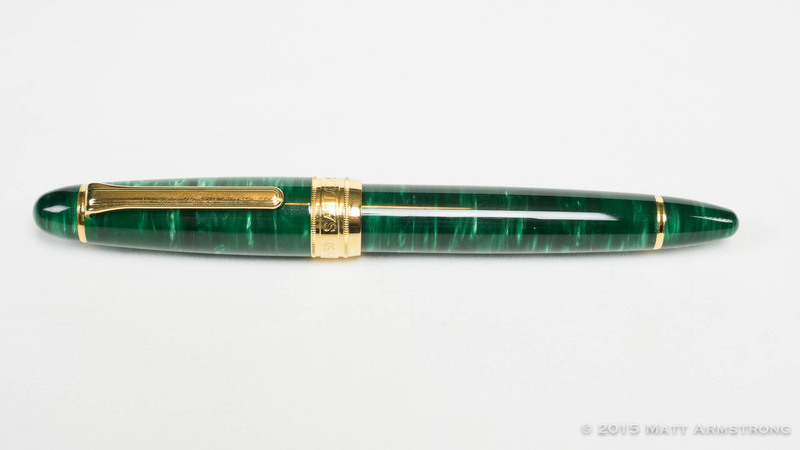 I purchased my first LB5 in person at the DC Show in 2015 when I spied the Midorigi Green on Andy’s table. After a bit of hemming and hawing over the price (and losing out on the floor model to someone else), I decided to go all in and purchased it. 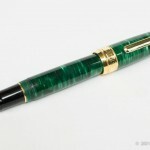 I was completely entranced by the pen, and used it daily for about a month. 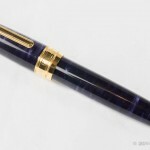 I was so entranced, in fact, that I began research online to learn more about the other colors of the pen and stumbled across the Tairiku Amethyst Mauve version of the pen. 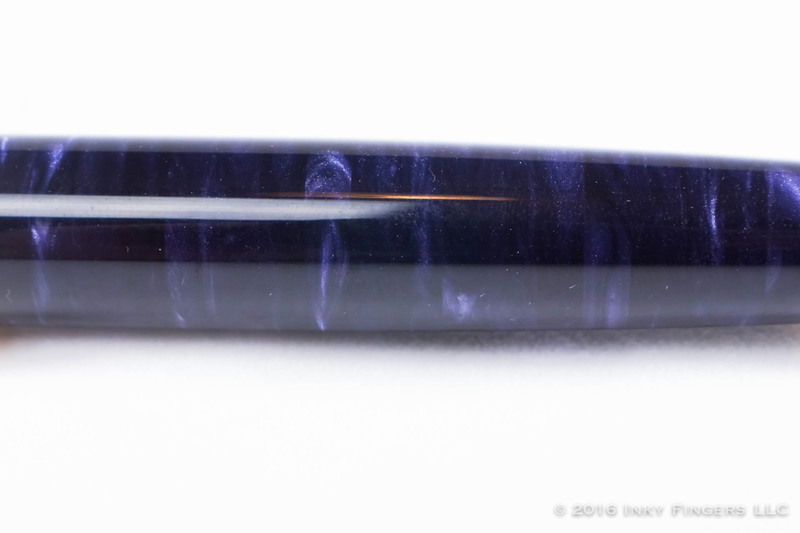 I’ve often said that there aren’t enough purple pens, and most of the purple pens out there are light lilac purple that look like unicorn farts. 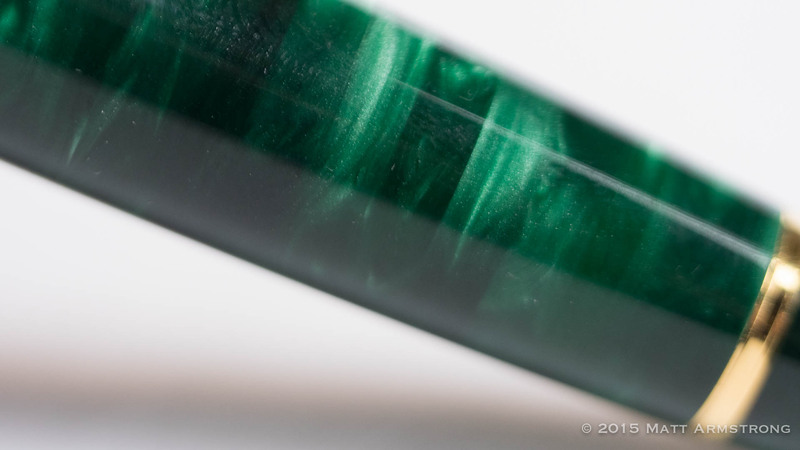 The Tairiku was deep and rich, like a vein of Blue John Quartz. It was stunning. 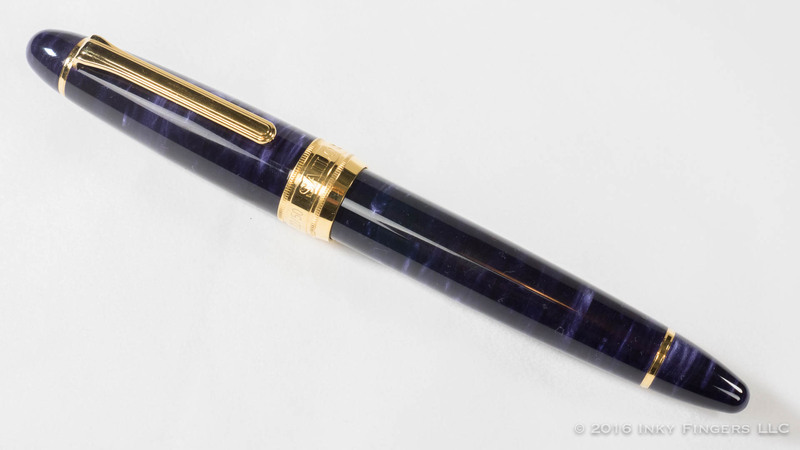 Being based on Sailor’s King Profit model, the LB5 is admittedly a large pen. 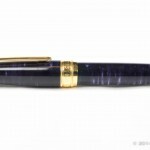 It has a relatively standard cigar shape that is a touch more slender and streamlined than, say, a Montblanc 149, although they are of a similar size. 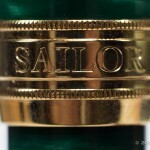 The cap has a tapered-but-rounded finial which holds on the large, standard-design Sailor clip which is somewhat stingy and very solid. 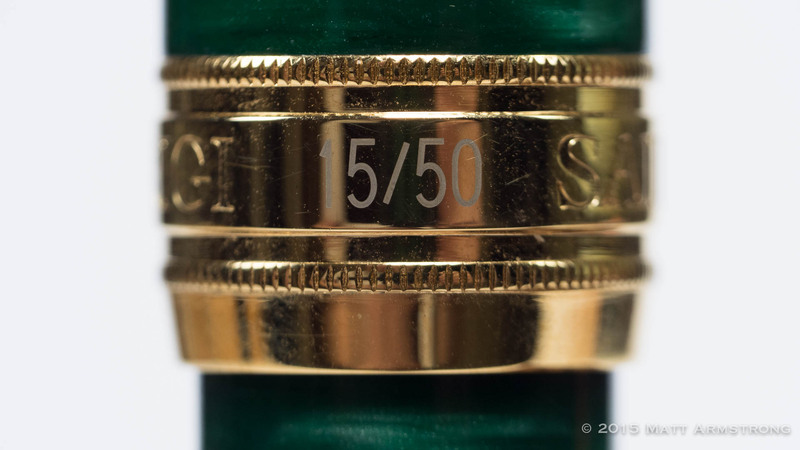 The wide metal cap band has two knurled ridges in between which are stamped “Sailor LB5” and either “Tairiku” or “Midorigi.” The Edition number (22/50 on the Tairiku, 15/50 on the Midorigi) is engraved rather than stamped into the metal. 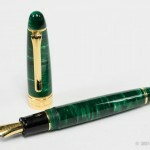 The cap requires 1.5 rotations to remove it from the body of the pen, and it glides on perfectly tight and smooth threads. 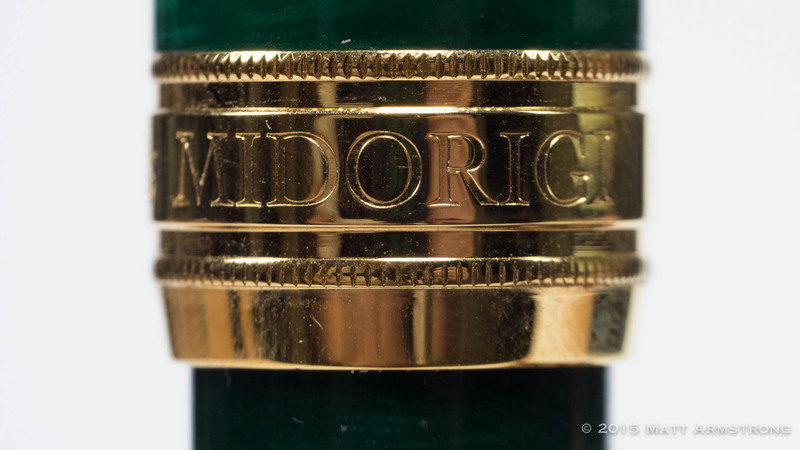 The barrel is largely unadorned, save but for a single gold washer to separate the finial from the barrel. 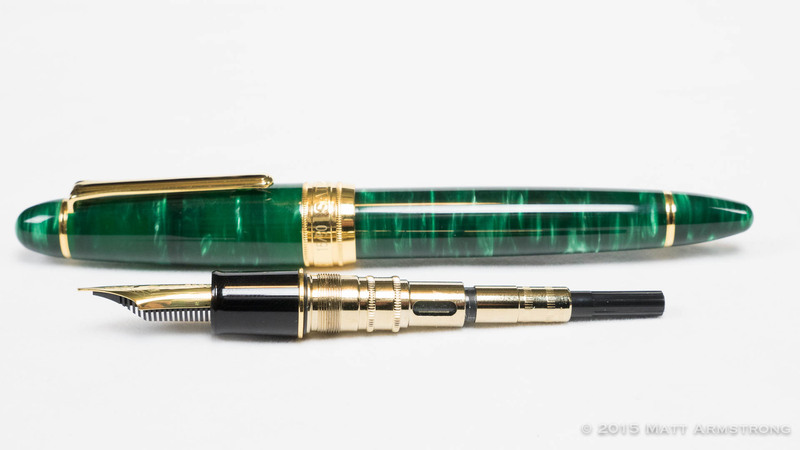 The finial is completely unnecessary from a functionality standpoint (this is a cartridge/converter pen, not a piston-filler), but it balances out the finial on the top nicely. 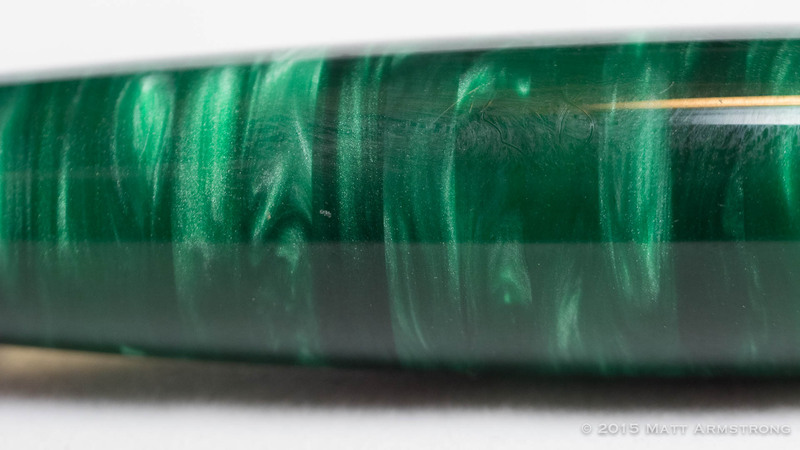 I am also glad that Sailor/Classic Pens chose not to imprint anything on the barrel, as to do so would only detract from the incredible color and depth of the diffusion-bonded acrylic. 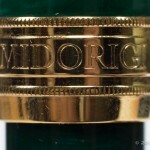 Under the cap you have a black acrylic section separated from the barrel with another gold washer. 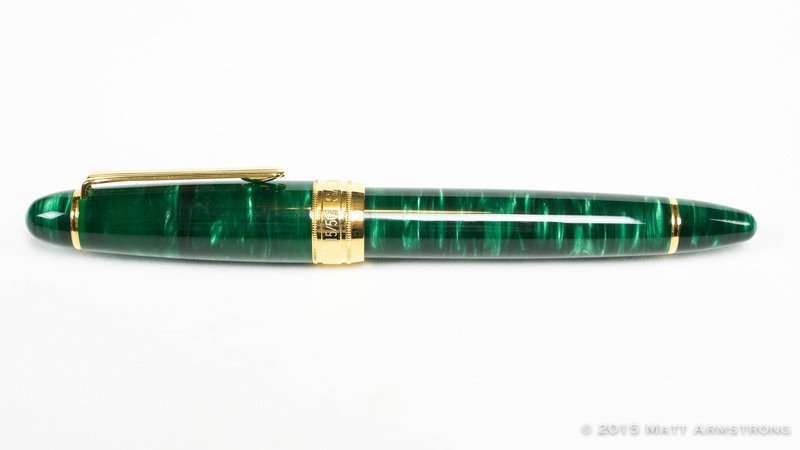 The section is rather on the thick side (not unlike a Pelikan M1000 or MB 149) but has a slight taper that makes it more comfortable to hold than most oversized section. 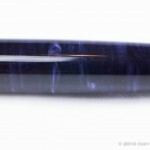 It also ends in a nice light flare right before the nib. 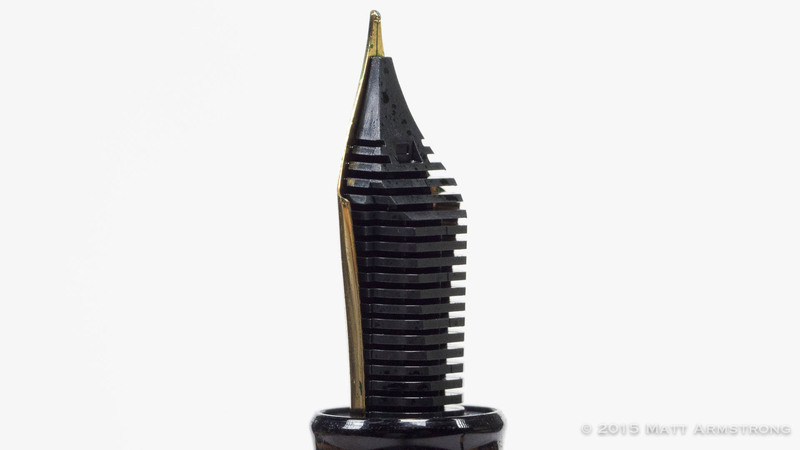 The nib itself is a massive 21k gold monstrosity—and I mean that in the best possible way. 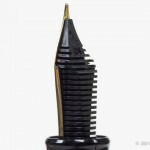 This nib is huge. 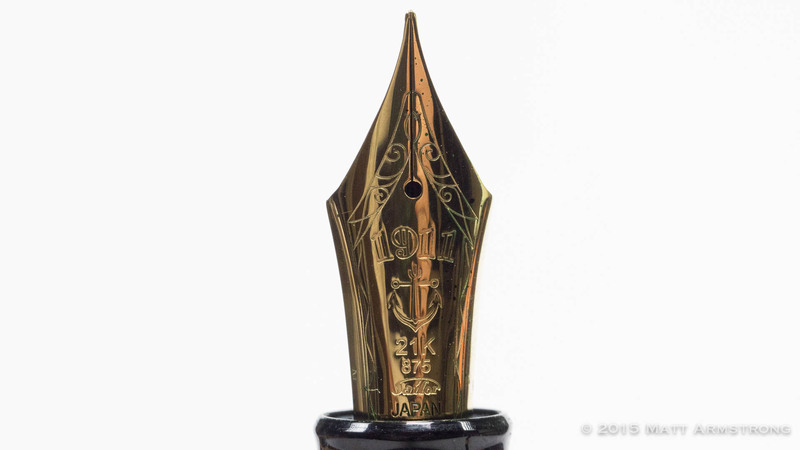 You would expect a nib this size with such a high gold content to be somewhat soft. 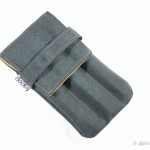 It is, surprisingly, rather rigid. 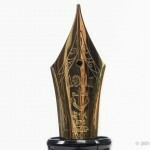 And the fact that the nib is 21k gold means that this is not a nib out of which you can “push” a bit of line variation. 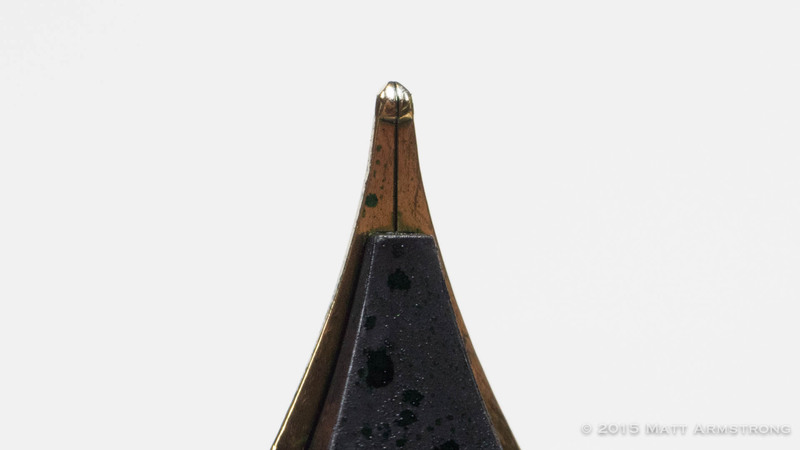 Without the stabilizing snapback of the other metals in the alloy, pushing this nib means you run a greatly increased risk of springing the tines. 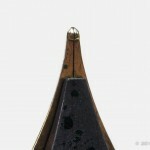 As well-tuned as they are (and they are exceptionally well-tuned), I find the polish on the nib tip to be inadequate. 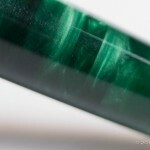 Sailor, across their entire line of pens and nibs, chooses to polish their nibs to a rougher, more feedback-prone finish. 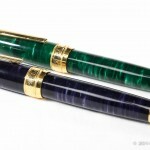 (This is similar to the way that Italian maker Aurora finishes its nibs.) 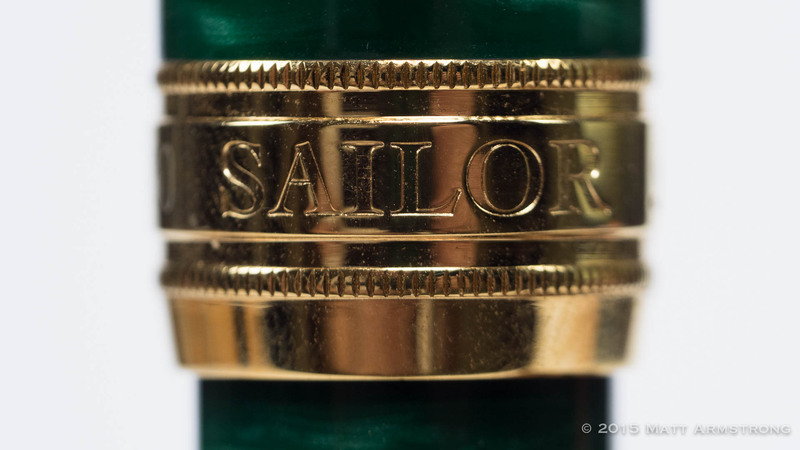 I wish that Sailor would offer a smoother, less feedback-prone, nib, but running one of their nibs over a bit of 12000 grit MicroMesh™ can get me to my desired smoothness quickly. 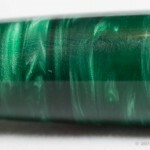 Once that’s done, I’m 100% in love with this nib. 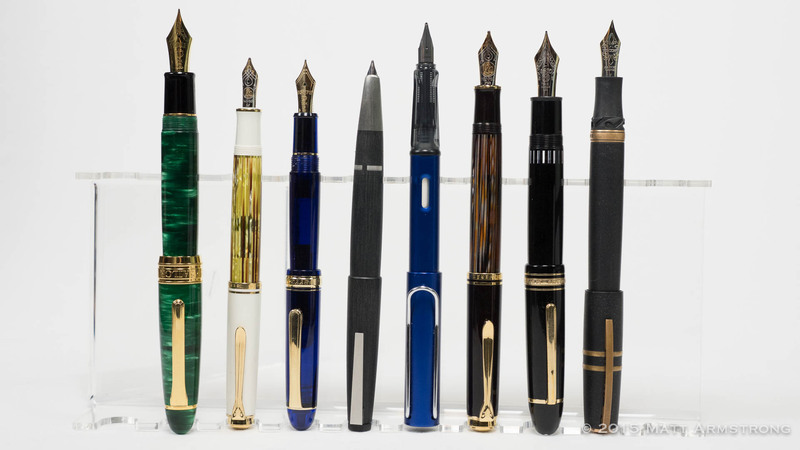 I should also spend a bit of time on the filling system for the Classic Pens LB5. 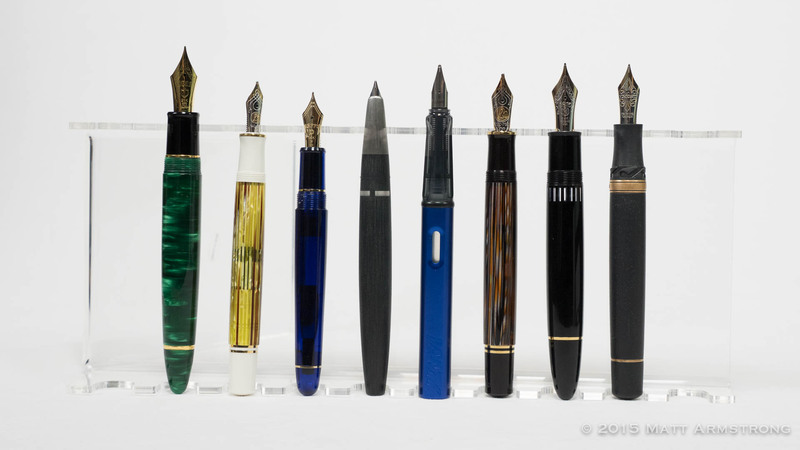 Most pens in this price range eschew the more “pedestrian” cartridge/converter filling system for something more “high-end.” Sailor, in both the King Profit and the Classic Pens LB5, chooses to stick with the ease and convenience of cartridge/converter filling. 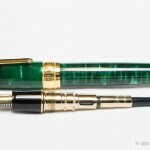 This does feel a little cheap on such an expensive pen, especially as Sailor’s converters are on the flimsy side. 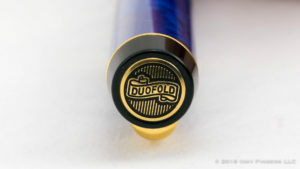 Upon removing the section from the barrel, you find a huge gold-plated tenon which serves almost like a throne for the proprietary cartridges or converters. 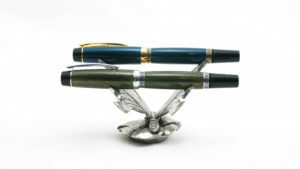 The converter, when firmly seated in the pen, is nearly completely covered by the metal collar which contains cutouts allowing you to monitor ink levels. 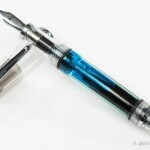 It would have been nice to if the LB5 had opted for a piston or vac-filling system instead (giving you a larger ink capacity and something that felt a little more robust), but the C/C filling system doesn’t bother me. And it does make cleaning the pen significantly easier. 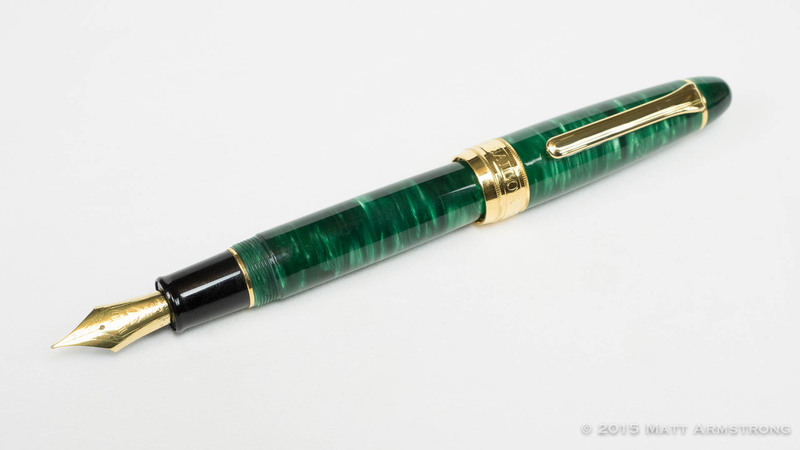 Fortunately, the converter/feed system on the LB5 is well-designed enough that the pen exhibits none of the ink starvation or flow issues you often find with other C/C pens. 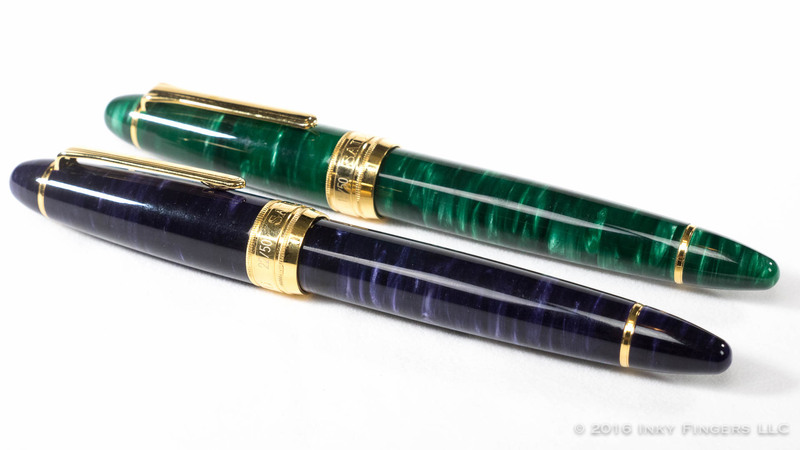 Writing with the Classic Pens LB5 is a true joy. 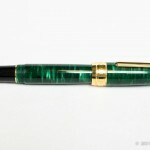 The fit in my hand is nothing short of miraculous; the pen feeling like it is an extension of your arm. 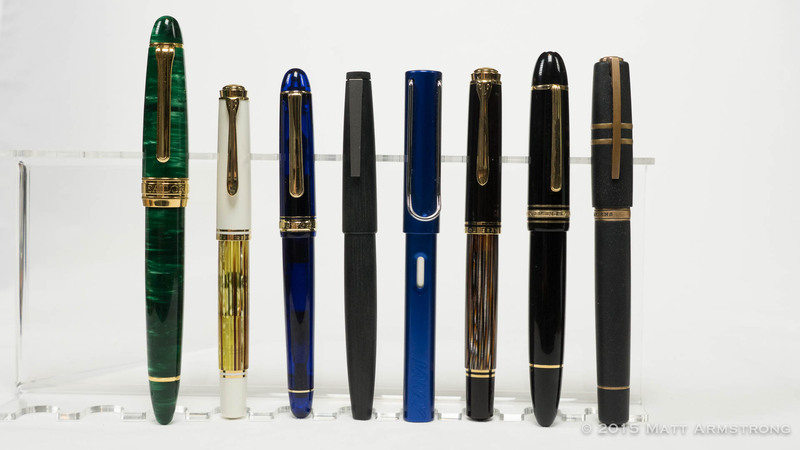 Even people who prefer smaller pens have told me they find it surprisingly comfortable. It is long enough that posting is unnecessary. 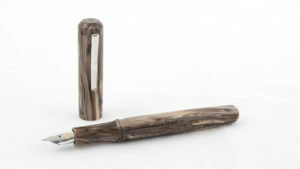 If you do like writing with a baseball bat, though, you can post the pen. 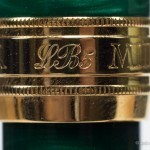 Is the LB5 worth the steep price of $1250? Well, like most things, it is only worth the price if you are willing or able to pay it. 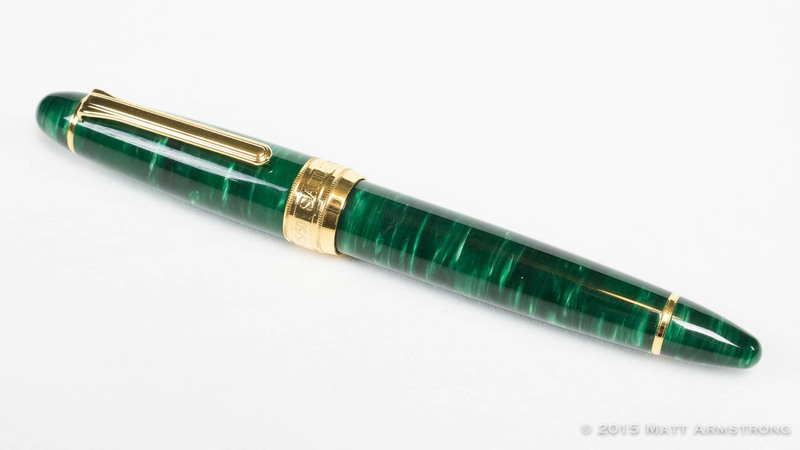 I found enough value in this pen (both utilitarian and aesthetic value) to warrant paying that price not only once, but twice. In the end, it has probably saved me money because I am so happy with these pens I have not purchased another one (to keep for myself) since. I just love them that much. 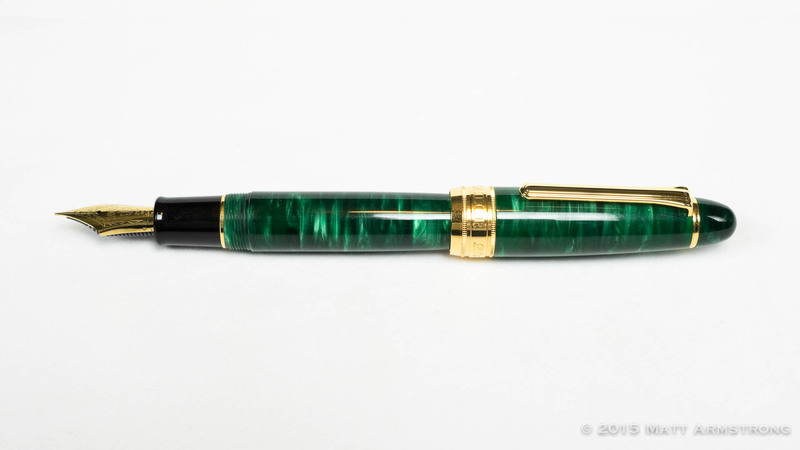 Spoiler Alert: You can expect to see this one at the top of my Top 5 or Top 10 pens list at the end of the season.